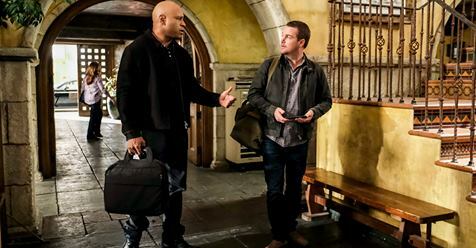 Tonight’s NCIS: Los Angeles recap begins now – Refresh Page often to get the most current updates! The team was investigating a robbery. They were told that two masked gunmen ambushed a marijuana dispensary SUV and injured the passenger while the driver seeming got away. There was no evidence where the drive could have gone, but his passenger was why this became an NCIS case. They were brought in because the man that was grievously injured was identified as Navy SEAL Chief Petty Officer Alonzo Garcia. Garcia was moonlighting as security because these drug businesses couldn’t rent armored trucks or work with any federally funded banks because marijuana wasn’t legal on the federal level and so they had to make their all-cash payments to the Bureau of Cannabis Control the long way. They hired servicemen to make the money run to Arizona on their own and most of the time these guys were carrying large amounts of cash. This truck, in particular, was carrying over two hundred and fifty thousand dollars. The company owns several dispensaries in Los Angeles and they have to make a payment based on what they take in at each store. Hence why there was so much on this last run. The team figured that was a chance that the driver might have been involved and that’s why he disappeared, but they also tried questioning Garcia. Garcia couldn’t talk because the of the tube in his throat and so he communicated via Morse Code. He would blink out the code and he tried to tell the team that this was an SOS situation. They told him that they understood he had been cornered and they told him that he did everything he could. He at least stayed around to fight and that’s why they tried asking about his partner. Garcia couldn’t get a word out before he began to hyperventilate and so the doctors had to end his interview. They said that the patient needed to recover first and no one wanted to push Garcia, but they didn’t learn anything new from him. He couldn’t tell them about the heist nor could he identify anyone. The team tried going to the woman that owns the company and she basically told them that she has no reason to suspect anyone on her payroll of being behind the heist. She pays a great salary and even offers full medical benefits. She doesn’t have disgruntled former employees because everyone that was working for her needs this job. She also said that if someone was going to betray her than why now and not when she first opened a dispensary. Things were different back then and she wasn’t sure she could have trusted anyone because people were worried about the legality of working for her. It wasn’t what the team wanted to hear, but it made sense. There was no reason to betray the company and risk a steady job for a one-off payday. So they began looking elsewhere for answers. They questioned if the robbery had simply been a means to an end and so they went back to the evidence they do have in custody. They ran an analysis on the ammo they found at the scene and they came back with a match to a felon. Brian Booker has a long criminal record and his prints were found on the spent bullets. He also tried to run when the team came knocking at his door and so they were forced to chase him but Sam might have put too much anger into his effort. He was so angry that a fellow SEAL was injured that he used a surfboard to knock Booker unconscious and he was going to kill him if the team hadn’t told him to stand down. Booker needed to be convinced to talk to them and after Sam’s stunt, he demanded his lawyer right off. He wasn’t going to talk without his lawyer present and so the team went through his house. They found a bunch of crap until Kensi came across a burner. This burner was in constant communication with two others and these other people made sure to take out their SIM card frequently so that it couldn’t be traced. The team had to work on their end into forcing someone to turn their phone on and once it happened it led them to their next suspect. The second guy was Edward Morrison. He lived at the house he grew up in and he’s been living there alone since his mother died. And that could be why he lost it. Edward became a recluse and he started shooting at the team the second they announced they were federal agents. They had to call in backup just to ram the door and afterward they had to deal with an even stupider situation. Edward who had locked himself into a room had begun to cry. He said that he couldn’t move or reach his gun and he asked for help. Only when they rammed the door, Edward who was perfectly fine had gotten up again and tried shooting at them. The team was forced to return fire and they killed him but not before they heard him yell “You Will Never Replace Us”. Most of them recognized that as being the chant of White Nationalists and they found proof of Edward’s allegiance in the house. He was a hoarder and so he kept everything. And that included receipts. Edward and his buddies have been buying up guns at gun shows and they were stockpiling them. It turns out the money they stole was to help pay for even more weapons and so the team knew that his cohorts were about to target a place, but they were told that there was immigration rally nearby and so they went there and that’s when they ran into the driver. He was sitting on a rooftop just waiting to kill a bunch of people because the ignorant and the hateful believe that the white people were slowly being erased in America. They were wrong and the team was able to arrest the last man in this conspiracy. But it came close and no one was going to forget that Garcia’s friend had been the one to turn against him.